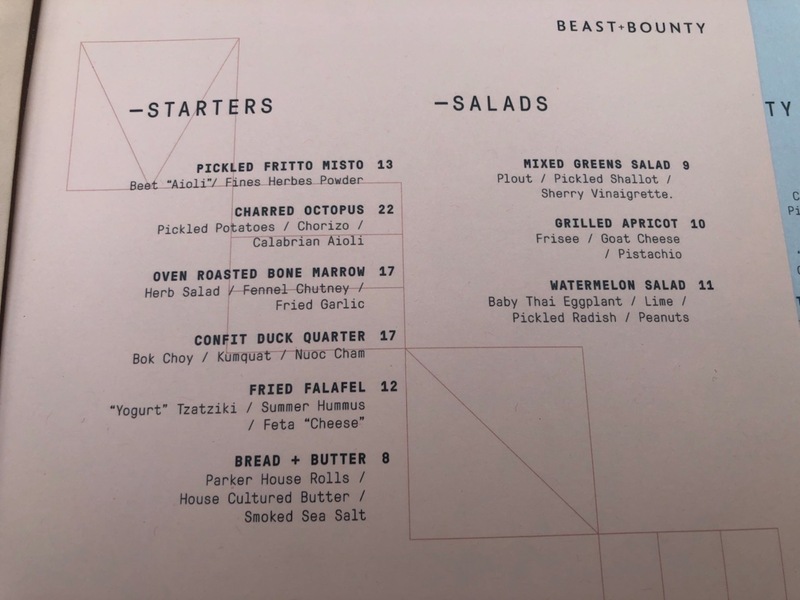 Michael Hargis (owner of LowBrau (Link to Our Review), Block Butcher Bar, & Milk Money) and his team spent more than a year perfecting every aspect of their newest hit, Beast + Bounty. The wait was absolutely worth it! We had 7pm dinner reservations on this Sunday in July and were arriving just as the sun was getting low in the sky. 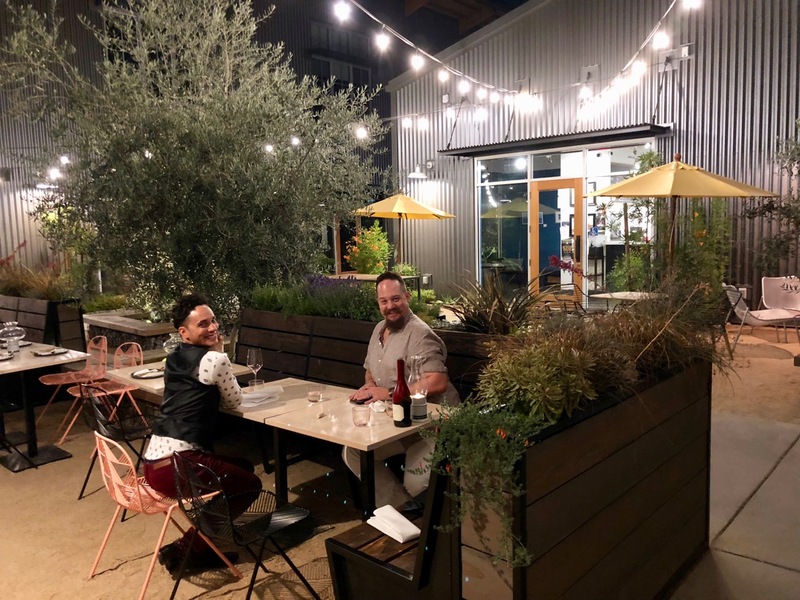 Housed in what used to be Orchard Supply Co, the outside of the building is impressive by itself with its tall modern angled roof, brick facade, massive sliding panel doors of reclaimed wood, and patio complete with bocce court. 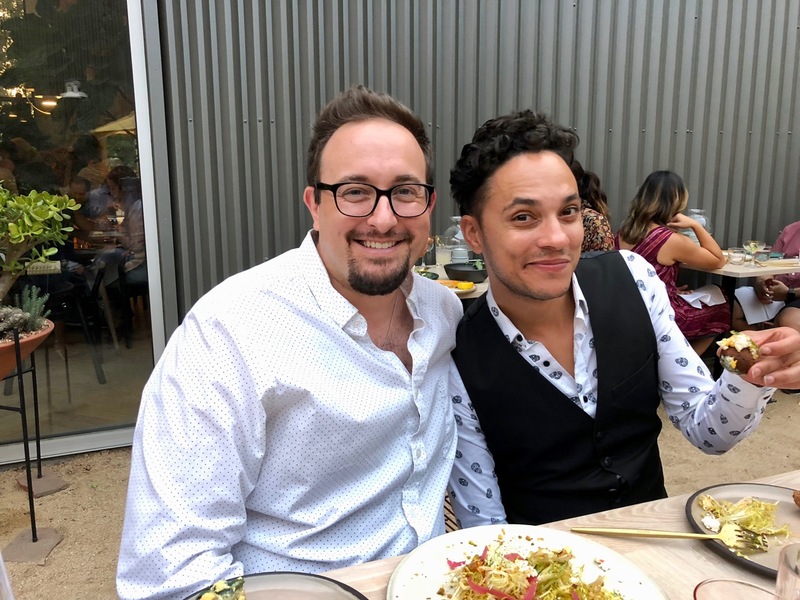 As we entered, we were immediately greeted by the hostess who showed us to our table on the patio. 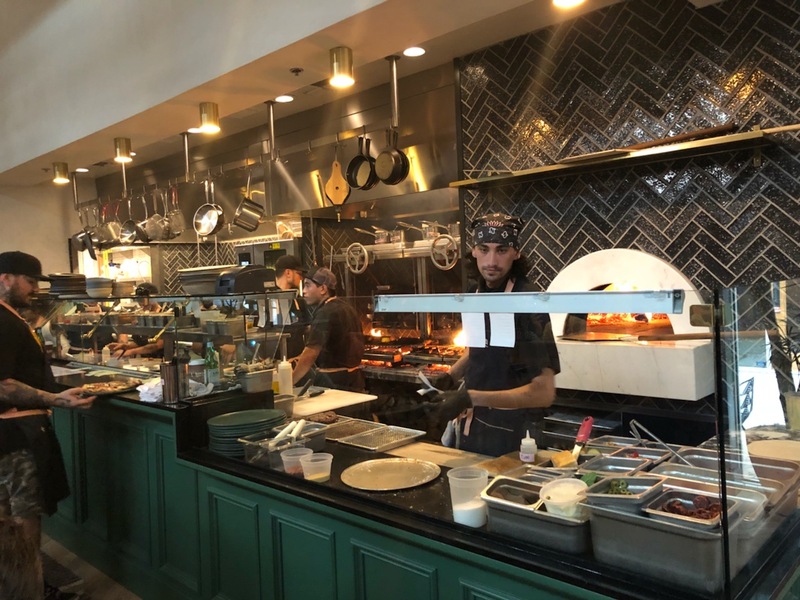 As we walked through the open, airy restaurant, the smell from the wood burning grills and pizza oven awakened our senses and set the stage for the menu we were presented. As our server explained the concept of the restaurant is to be inclusive of all eaters. So many places make modifications to their dishes to make them vegan or have only one option or two for those that are gluten free. 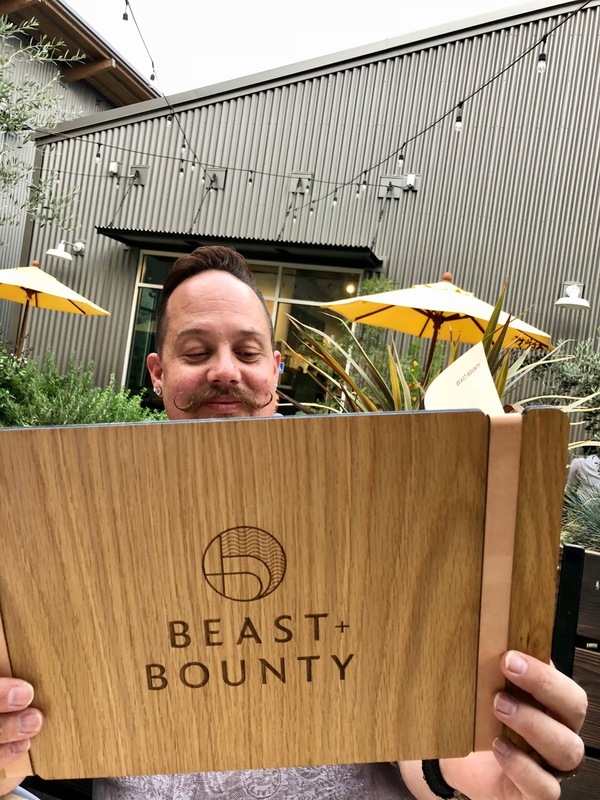 Beast + Bounty is looking to change that and Executive Chef, Brock Macdonald started from the ground up with options for vegans and meat lovers equally. 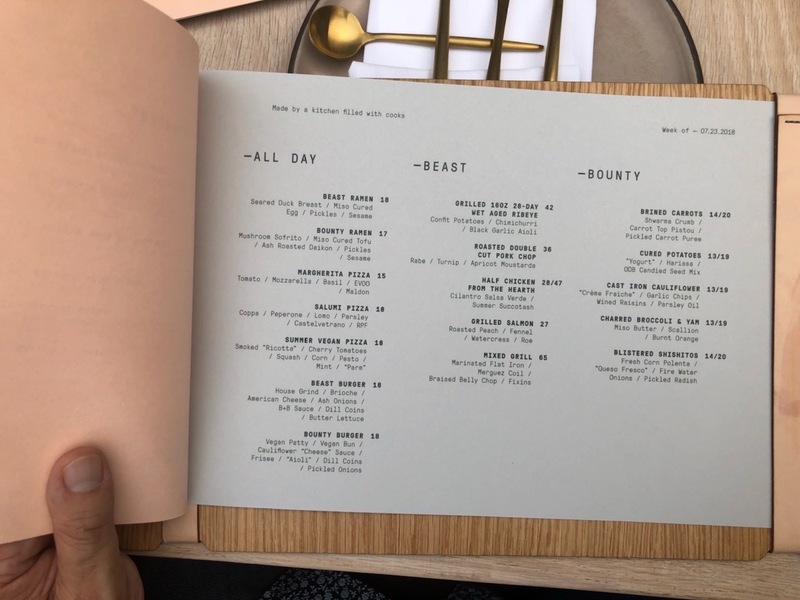 In fact, half of the menu is dedicated to Bounty (or vegan/vegetarian) dishes and the other half to Beast (meat dishes). While we were all omnivores at our table, we picked a selection of half Beast and half Bounty dishes. 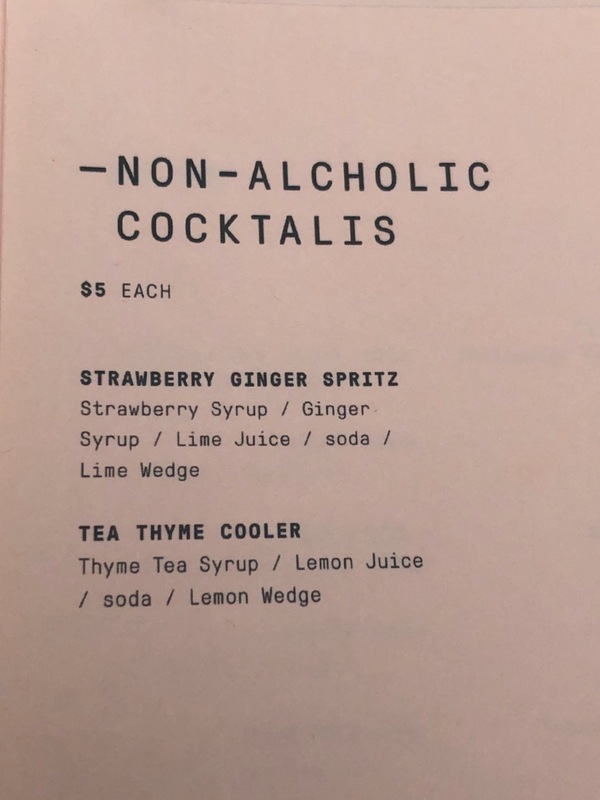 We were also quite impressed that they had a couple of high quality non-alcoholic "mixed drinks," including a spritz and an infused tea, prominently displayed on their menu, which is not something you see very often. 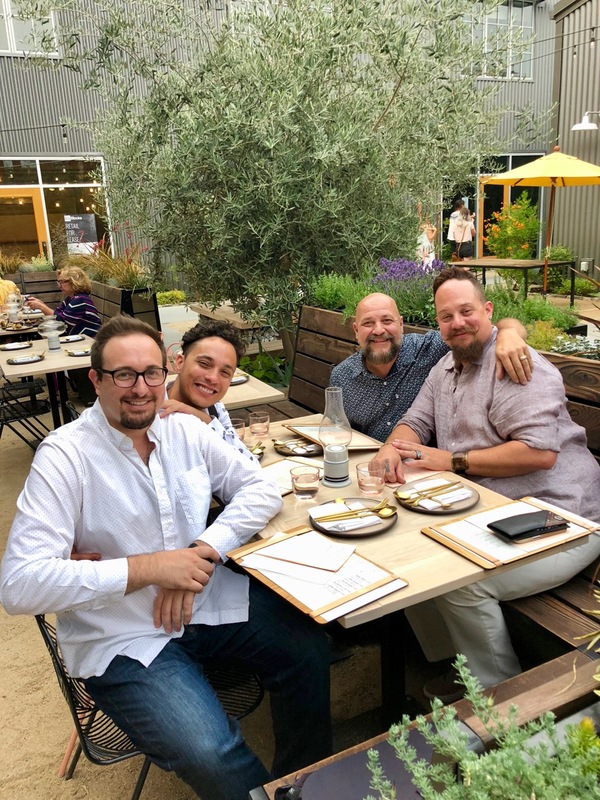 With our order placed, we enjoyed the patio space and the cool summer evening. 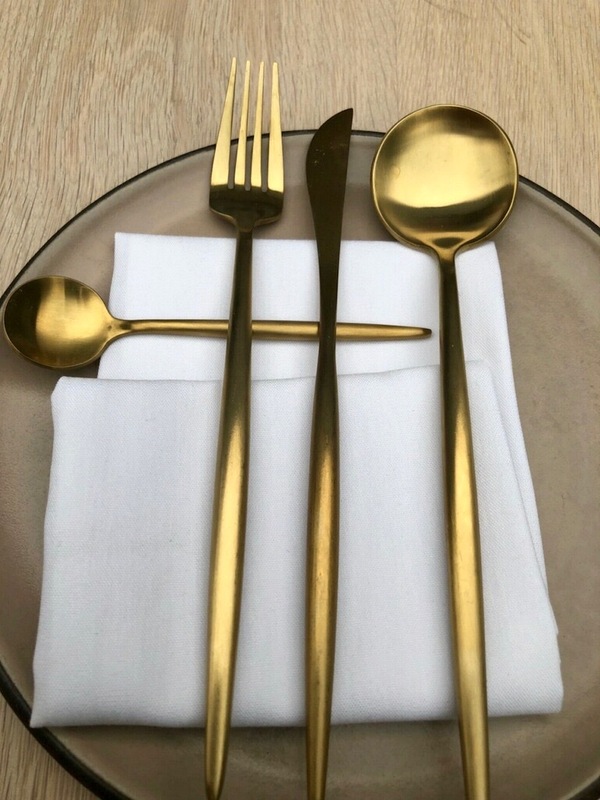 Everything about the restaurant seems to have been thought about. The rose colored glasses, brass flatware & hand thrown plates were a pleasing combination of modern and refined, but approachable. The lights, the chairs, the tables, the live succulents & herbs around our table, all seemed perfect. As our first courses emerged, we were awestruck. We ordered the Charred Octopus, Fried Falafel, Bread + Butter, & Grilled Apricot Salad and each one looked like a work of art. 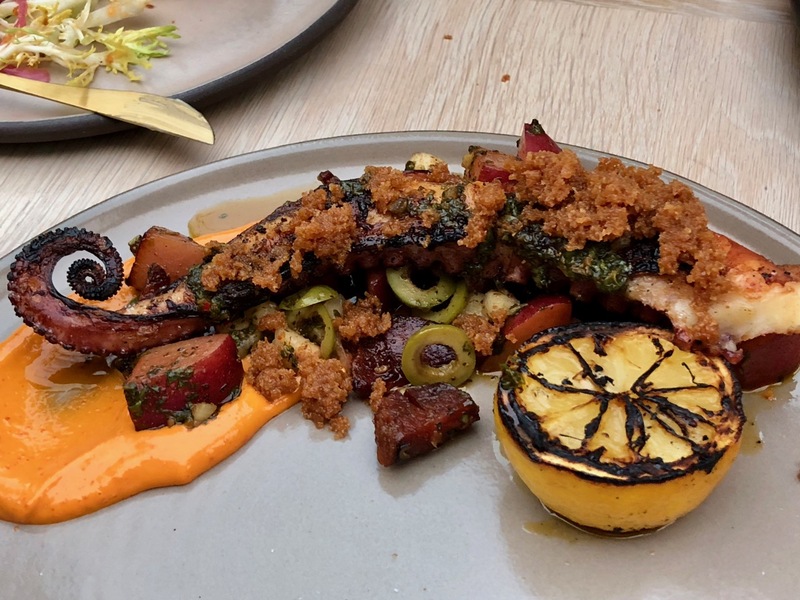 The octopus was particularly noteworthy for us because it was so tender and the picked potatoes, chorizo and aioli sauce were the perfect accompaniments. 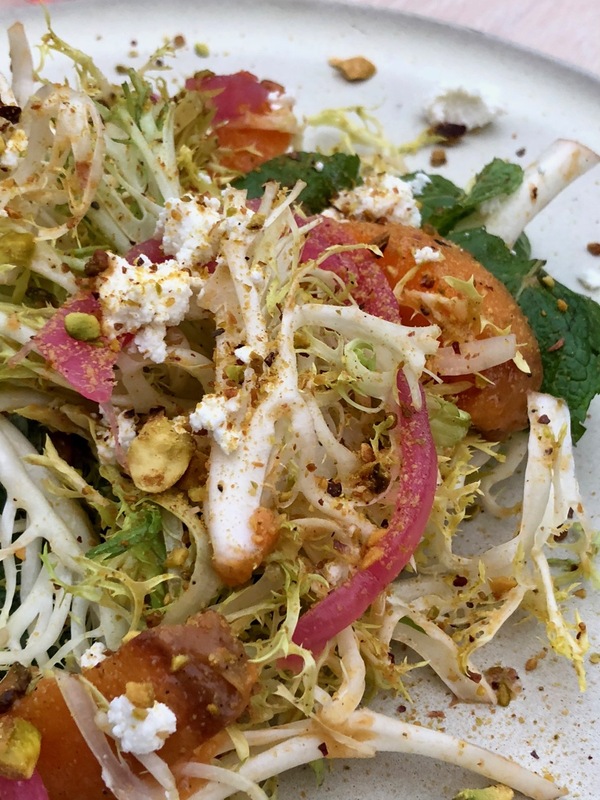 We also loved the grilled apricot salad, which was layered and complex. The Bread + Butter included butter that had been aged for 9 months, giving it almost a cheese-like nature and pungency. Our mains were huge, easily enough to share. I would suggest at least 2 people to an entree. 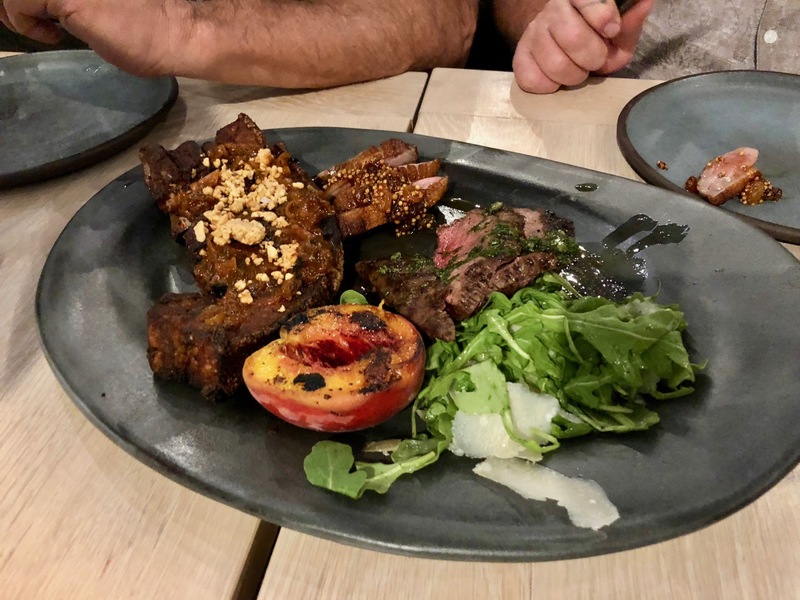 We shared the Cast Iron Cauliflower, Blistered Shishitos, and the Mixed Grill, which included a braised and fried on-the-bone pork belly chop, duck breast confit, and marinated flat iron steak. The meat was incredible and it balanced nicely against the two Bounty dishes that held their own. We absolutely loved the Shishito Peppers, which came dressed "elote style" with queso fresco, pickled bits, and a fresh corn polenta. 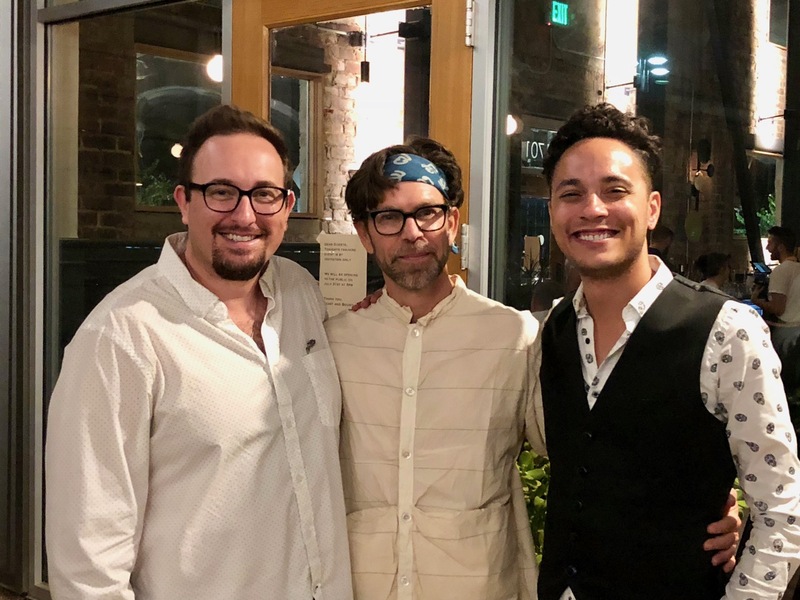 We heard that back in the kitchen, pastry chef Edward Martinez, previously of a 2-Michelin-star restaurant in San Francisco, was whipping up some incredible desserts, so we saved a little room at the end. 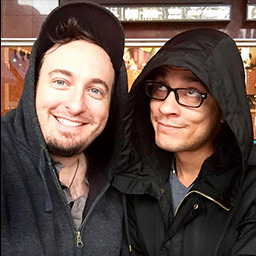 We selected the blackberry eclair and the peach "donut," which were hard to eat because they were so beautiful, but alas we set our spoons to kill and dove in. 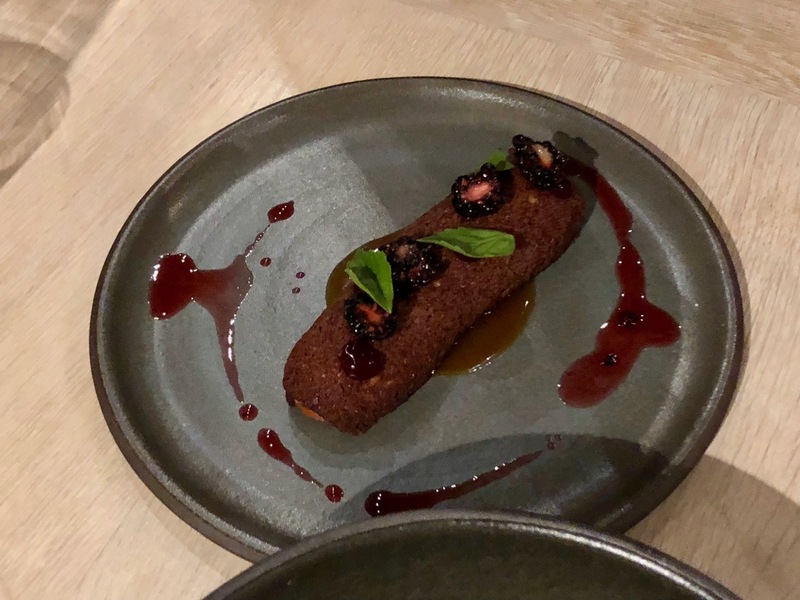 The blackberry eclair was incredibly delicious, not too sweet, but complex, and with the rich berry and creaminess you'd expect from something with this name. 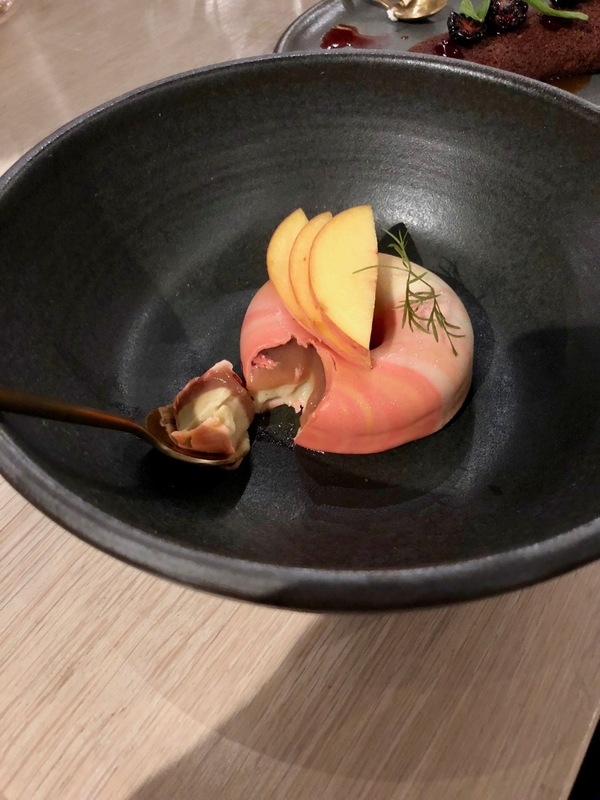 The unexpected surprise was cracking into the "donut" which contained a creamy, jam-like peach jelly and cream. The desserts were incredible. I can confirm that, despite the generous portions, the food was so delicious that we cleaned every plate. We were incredibly impressed by the fine dining experience without any of the usual stuffiness. 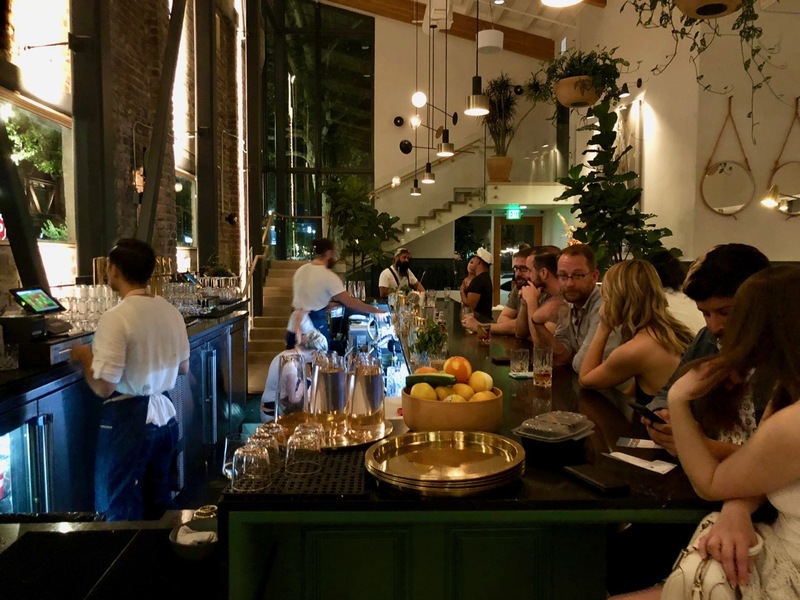 Beast + Bounty has something for everyone (regardless of dietary restrictions) and will be open for breakfast, lunch, and dinner 7-days a week. Tip: Their all-day menu is very affordably priced and would be an excellent alternative if you're looking for lighter fare or you're on a budget and still want to experience this incredible place.